Carole Lazorisak is best known for her ASL classes at LaGuardia Community College on Staten Island, New York. Her distinguished career as a teacher, professor, consultant, mentor, and presenter, has encompassed interpreting, languages, and community activism. A native of Staten Island, where she still lives, Lazorisak grew up during the last two decades of the "Dark Age" of deaf education. She attended a school for the deaf, becoming a skilled speechreader, and learned sign language outside the classroom. Mainstreamed in public schools, she began to recognize that she was "different." At Gallaudet College, she majored in Psychology, enjoying the exposure to various sign languages and cultural backgrounds of her fellow students. At Gallaudet, she met her husband, Andy; they were married shortly after they graduated. He, too, is an ASL teacher and storyteller. Among her credentials, Lazorisak holds Certified Deaf Interpreter and Reverse Skills certification from RID, and has several degrees. She's worked as a teacher, consultant, interpreter, interpreter trainer, in the areas of communication, language and cultural studies, interpreting, language and interpreter assessment, human relations, and professional and teacher training; she also advises Deaf Studies students at LaGuardia. She's considered an exemplary teacher, having inspired several students to pursue interpreting careers, and is beloved by her students, both deaf and hearing, not just because she's a superb teacher, but because of her wholehearted concern for them as people—their well-being, their success, their growth. She's the kind of teacher that students love to have, the kind whose classes are well-populated by "old faces"—students who want to take whatever classes she's teaching. She attests to her love of teaching and her students; they attest to her being "an amazing inspiration." Sign-language students who aren't able to enroll at LaGuardia can still benefit from Lazorisak's expertise. 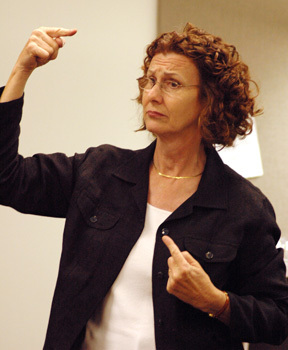 The Complete Idiot's Guide to Conversational Sign Language Illustrated, a multimedia course that she co-authored with her daughter, Dawn Donahue, with diagrams by Andy, was published in 2004. It has gotten unanimously favorable reviews from customers on Amazon.com.